The 'Asset Development Plan' for Greece is out and it's all go for the privatization of the country. Hellenic sea ports, air ports, motorways, petroleum companies, water and gas supply, real estate, holiday resorts - it's all for sale. Debt laden Greece has been forced to sell the family silver in an all too familiar tale with ancient history repeating itself. The Hellenic Public Asset Development Fund has been published by German Green MEP Sven Giegold who said the Greek people "hardly know" what will be sold off and that they have "the right" to know. The selling of Greek assets to raise $56 billion (€50bn) was demanded by Greece's creditors, the Troika. The document reveals that 66 percent of a gas distribution and processing firm will be sold to Azerbaijan; 35 percent of Greece's first oil refinery firm will be sold off along with 17 percent of its electricity distributor and 65 percent of gas distributor Depa. All rail and bus services will go under the hammer — along with the Greek telephone and postal service. Even before the bailout deal was completed and the money arrived safely in the Greek banks, the Germans had won their bid to take over 14 Greek airports for the next 40 years, paying $1.36 billion (€1.23bn) for the privilege. 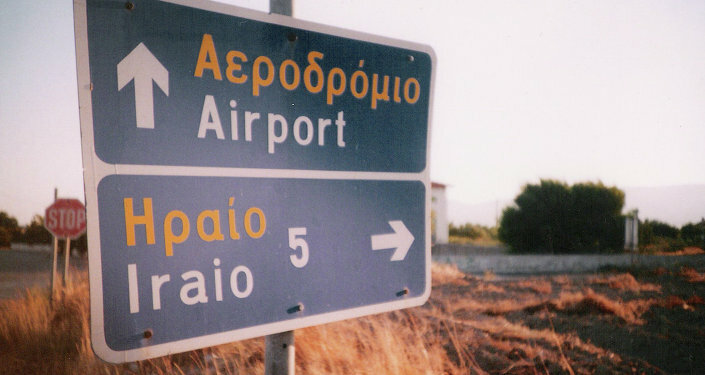 FRAPORT will own and operate Greece's most popular tourist island airports. Of the $56 billion (€50bn) needed in asset stripping and bank shares, only $8.69 billion (€7.7bn) has been agreed so far. Nick Dearden, economic expert and campaigner, says it makes "no sense to sell off valuable assets in the middle of Europe's worst depression in 70 years." Writing in Global Justice Now, Dearden says: "The vast majority of the funds raised will go back to the creditors in debt repayments, and to the recapitalization of Greek banks. "From German airport operators and phone companies to French railways — who are getting their hands on Greece's economy. Not to mention the European investment banks and legal firms who are making a fast buck along the way. "The self-interest of European governments in forcing these policies on Greece leaves a particularly unpleasant flavour…workers will be sacked and their conditions made worse, while the elite of Europe profits." Dearden continues to offer a scathing attack on the asset stripping of Greece. "Privatization in the context of the bailout accord is tantamount to expropriation, like forcing a bankrupt to sell the family silver in order to pay off debts…the victorious Northern European governments are now inviting their companies to partake in the spoils." It seems ancient history is repeating itself. In 1871, the ancient Greek city of Troy was crudely excavated by German businessman and archaeologist Heinrich Schliemann using dynamite which destroyed many significant artefacts; his exploration methods condemned. But the spoils of Troy always remained in Schliemann's hands — who in 1884 handed the entire collection to Berlin. Today's Greek spoils are in the hands of the Troika which will oversee every deal made and decide where the money goes.